“Manchester City Council said it had “listened carefully to the concerns of the local community”. If you look at the cutting of wetland film this doesn’t look like retaining wooded wetland . The wooded area was planned to be cut and little has changed. -Trees will always be in conflict and I suspect the trees will loose out just like the clear cutting of the Peace Garden did a few weeks ago in city center. How many of the people of Manchester did you consult about their Peace Garden (seem familiar story). Would the Council be willing to put tree protection orders on all the trees around the courts that they are willing to save now after listening to the people ? That would be really listening. Are you to really willing to Listen and act on this request for TPO’s. and as far as the lake goes with nesting herons would you be willing to hear we don’t want the beautiful trees cut down around the lake with out really talking and listening to what we want? With regards to your e-mail dated 16th August 2011. This entry was posted in news and tagged Alexandra Park, campaign, community protest, conservation, cutting, ecology, environment, felling, friends of alexandra park, heritage lottery fund, Manchester, Manchester City Council, nature, trees, Whalley Range. Bookmark the permalink. Thanks for responding as I raised this in the FB group. Could you help strengthen my argument further by showing what has changed from the master-plan to now (18-Feb-13)? For example in your opening paragraph you say “The wooded area was planned to be cut and little has changed”; does this mean we have won a small battle or “little has changed = nothing has changed”. I ask so that I can go back to the Cllr with the complete picture – I believe this will help strengthen my argument that more trees should be retained. Thanks in advance for your help. The only change council reflected back to us was to consider wetland grasses in this area as opposed to the original plan which said the area would be returned to grass. 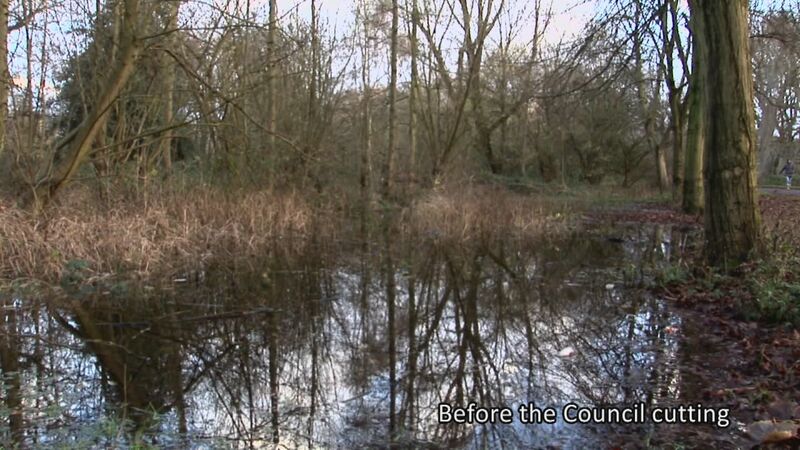 As you can see from the film that was always going to be a very tall order as Jacqueline Whitworth the council contract planner indicated on 1st Dec2012 at the Council Open Day in the park that no drainage work was planned. Note the Council has actually destroyed more tree numbers than they have admitted to the public and press so its basically a press related con job in actual tree numbers cut as they keep quoting the 258 reduced to 230 odd etc. The number of trees cut in the area was far more than the figures hence the 413 trees and 137 small ones less than 6 inches the council had 258 originally and 93 trees of 3 to 4 inches planted. all these films are under videos on this WordPress site. The area in the photo is clearly Wet Woodland, this is a UKBAP priority habitat. You could try approaching Greater Manchester Ecology Unit about formally making the area a Site of Biological Importance (SBI). 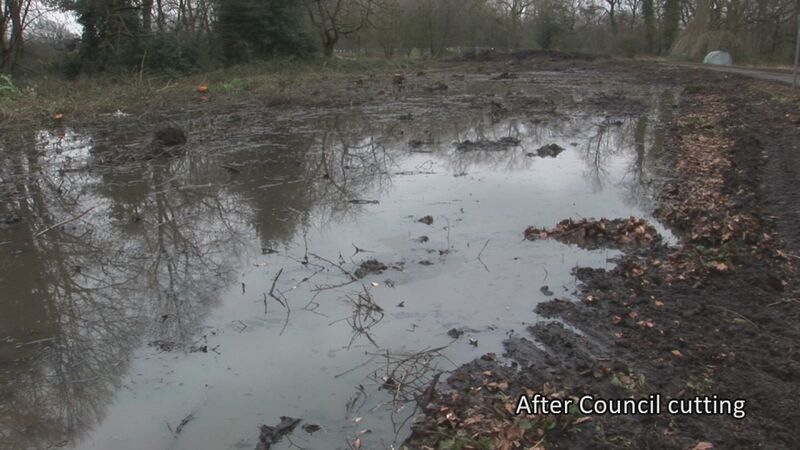 If trees are removed from wet woodland these areas tend to dry out, so it is really important the area is planted up quickly with species like alder and willow to preserve the original habitat. I have other issues about the tennis courts. The planning permission says only that they will be built. It has no details. In very small print it refers to a 3 metre high wire mesh fence which will block the view of half of the park for the people on Smalldale Avenue. The planning application says that EVERY SINGLE HOUSE on Smalldale Aveunue has been conusulted. I have yet to find a single person who has been consulted. The first detail most saw was on the maps Circulated by the Save the trees group. I t also says that minor details like the PRICING STRUCTURE, will be decided later. I have been told that it may be a BEACON SCHEME, which if you google this, says that a tennis club can gain this status if it gives a few free slots to the locals. One has free slots on two out of its 10 courts, at 7am on a monday wed and fri, as well as an hour on a saturday and sunday afternoon. Another from what I could see had only a 2 hour slot on a sunday afternoon. The rest of the time, normal charges apply. One such club charged £6 for a child and £12 for an adult. Even in a free slot , you might have to pay eg a £5 deposit for a racket. This is not inclusive and the first response I got in discussing what could happen was “Oh so the fence is to keep the locals out” – not to keep the balls in. If this happens and the locals view the cage as “containing” the well off, it will cause resentments. IF the scheme then fails, we will be left with a derelict cage, obscuring our view and collecting litter. This may not be the inclusive idea of getting local kids to have a knock about and get interested in the sport (Before joining one of the several local clubs I am lead to believe exist) IF I am to sign up to a plan. I would like to know exactly what it is before I sign – particularly if I am to lose my beautiful view of half of the park. I am also concerned as to whether the access point will be closed off – it is not clear on the plans – is it going to be an access point to the club and not the park. ALL the locals enter the park through this point!!!! People I have spoken to have expressed anger especially when they have NOT been consulted. I have written to the council for answers, but have not so far had a reply. I also agree with the leaves issue, likely to fall on the courts and cause problems for them. WHY IS THIS NOT BEING SITED WHERE THE OLD COURTS WERE????? WHY SHOULD WE LOSE OUR VIEW WHEN THERE HAS BEEN NO DIRECT CONSULTATION WITH US. THIS IS SCANDALOUS!!! SORRY – CORRECTION – IN VERY SMALL PRINT ON THE MAP PROVIDED BY SAVE THE TREES, NOT IN THE PLANNING PERMISSION!! i DO NOT BELIEVE THAT IT SHOULD BE WHERE IT IS PROPOSED OR BE ALLOWED TO BLOCK OUR VIEW AND IF THERE ARE 4 COURTS AND IT DOES GO HERE, IT SHOULD NOT BE AT THE HOUSES END!!!! If you contact the Council and have not had a response within 7 days, please lodge a formal complaint via the council website. They have a duty to respond to residents. Can I ask too, if the tennis courts are to be run by some tennis club. On what basis will they have the facilities / land. Is it being rented to them or sold off to them? I have been following the awful situation at Alexandra Park since Dec 2012 and have raised a number of concerns with my councillor, Alistair Cox. I have received a reply from him but he clearly thinks that all is well with this brutal destruction of our park, that the consultation really captured what local people thought and this is overwhelmingly not true. I have been waiting for a proper response from Manchester City Council and am astonished that no-one has made any efforts to meet with us or to make a statement that answers the very valid questions that have been raised. I expected better from a Labour (majority) Council. I could go on at great length about what is wrong with all of this but I am certain you already know. Thank you for your email in which you have raised concerns about the Alexandra Park project. The tree felling is an element of the enabling works taking place in the park, which is part of the £5.5m restoration scheme that is jointly funded by the Council, Heritage Lottery Fund and a number of sporting bodies. The scheme will completely transform the park through its landscape and infrastructure refurbishment, the provision of state of the art sports facilities and the restoration of the historic buildings. It is intended to create a park that is fit for the 21st Century and is valued and accessed by the local community. The plans for Alexandra Park have been developed over 10 years and the Council has tried hard to involve as many people as possible in the consultation discussions. The 2011 consultation highlighted, for example, that the natural aspect of the park is very important to some users. This directly led to the creation within the plans of separately zoned areas. Three distinct zones were created – a Community Zone, a Natural Zone, and a Formal Zone. These modifications were introduced in direct response to feedback from consultation. Although Alexandra Park is a Grade II registered park, there is no intention to recreate a park that is totally Victorian in nature. By creating separate zones it is intended to create a contemporary park fit for modern day demands. 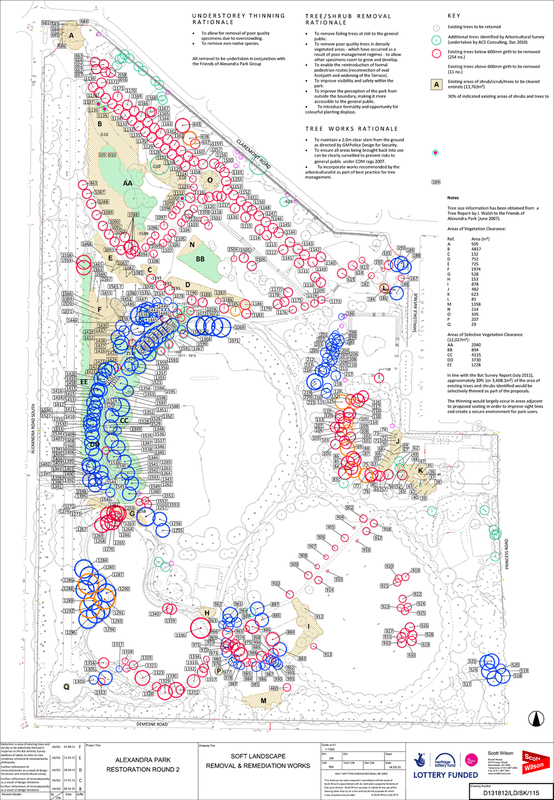 Consultation has shown that Alexandra Park has a diverse range of users. The intention is that by having the three zones with their own character and focus, the park will cater to the many differing needs and interests whether it is the natural world, heritage appreciation, social activity, sports or play. Consultation with the local community has always been an integral part of the process and a wide range of engagement has taken place, all of which has helped to shape and inform the overall scheme, with changes made over time in direct response to views raised during consultation. In preparation for the 2012 bid to the HLF there were over 1,700 separate consultations and in addition to this, there were a number of informal consultations with residents in the park and at meetings in the local area. By taking this approach to consultation, together with the publicity produced and dissemination of information via a number of networks, we aimed to ensure that there was a high level of awareness of the project in the local area. The results of the consultation that was conducted in the park in 2011 showed that the majority of people who already use the park feel safe in the daytime, but that safety is more of an issue at dusk and in the evening. This is particularly the case for women, with almost twice as many females as males stating they felt unsafe in the evening. 26% said they usually came to the park in the evening and it is likely that even more would do so if safety concerns were allayed. An additional survey of non-users in the local area told us that they feel that the park did not feel safe and is the reason that they do not visit. Thinning the overgrown shrubs and self seeded trees will allow sight lines to be opened up across the park and engender a feeling of safety, encouraging more people to use the park. More recent communications with Greater Manchester Police have also indicated that safety is an issue and we have agreed with them that more foot patrols will take place and that we will provide local officers and PCSO’s hot desk space in one of the renovated buildings. We have also been asked by Design for Security to not introduce shrubs which exceed 1m in height due to a general lack of visibility with the park. The Park covers an area of 60 acres; it has a stock of 1590 trees within the boundary walls. Whilst many have been planted, many are self sown and have developed within shrubberies which are dense, creating areas of the park where some people have expressed grave concerns over personal safety. 58 trees will be removed to address issues of personal safety. 92 trees will be planted in the park including varieties already present such as Lime, London Plane and Poplar and adding new species such as Oak, Rowan, Cherry, Apple trees, and Pear trees bringing greater diversity to the tree species in the park. Overall, 90% of the tree stock in the park will be retained. In addition, 7000m2 of a variety of plants and shrubs is also being planted, creating an area rich in flowering plants and berries essential to improving the biodiversity in the park and a home for wildlife. The Council recognises the importance of trees and that is why since 2006/07, we’ve overseen the planting of more than 92,000 in Manchester – some 10,300 this year alone. We have planning consent for the removal of 265 individual trees. However, as a result of regular design review and on-site mitigation during the works the individual tree removal count came down to 247. We have also taken a decision to reduce the number of new tennis courts being provided by the project from six to four and it is likely that we will be able to retain a further 15 trees in the location designated for the new courts. This decision was as a direct result of concerns raised locally and not taken lightly bearing in mind that the six court approach was fully funded by the Lawn Tennis Association. Overall this brings the current individual tree removal total down to 226 (12.5% reduction), with potentially more to come as we move through this phase of work. These changes are a product of our ongoing constructive dialogue with the community. A Tree Protection Plan has been formulated and will be installed following the clearance of dense vegetation. Due to the density of the existing vegetation in some areas, the network of hardstanding around the park and the requirement to retain as much of the park open to public access as possible, it is not feasible to fence each tree according to the Root Protection Area advised within BS 5837 2012. The clearance works are being undertaken in a manner to reduce impacts on retained trees. For example, tree felling within one area was undertaken by clearing from the outside towards the inside, and the felled trees are being felled to fall away from any existing trees which are being retained. They should be stored in a cardboard box and kept warm and dry, taking great care not to let them escape. It is feasible to store multiple hedgehogs in one box. The Hedgehog Preservation Society carer should be contacted – for Manchester, this is Barbara Roberts on 0161 445 5917 – and her facility is open 24 hours to take in the hedgehogs. Hedgehogs should be taken to the facility within a reasonable time frame and under no circumstances, left on site overnight. Areas with the potential for containing hedgehogs nests are areas of shrubs and scrub, piles of leaves and stockpiled vegetation. For the avoidance of doubt, all vegetation should be checked thoroughly prior to clearance. Shrub clearance is to be carried out using light weight machinery using a method statement and watching brief. If any cleared vegetation is to be stockpiled, it should be done so in a designated area of the site which would be left undisturbed until April, and subsequently removed in spring. Should any other hibernating animals be found during vegetation clearance they would be carefully placed under vegetation ensuring they are warm and dry. The GMEU will also be present on site when trees with Bat Roost Potential (BRP) are being felled, so that those trees would be checked for hibernating bats. GMEU visited the site in December 2012 to check which trees had BRP. We also have a qualified ecologist attending the site on a daily basis to work with our contract team in ensuring they adhere to the principles of the Biodiversity Master Plan and give advice on wildlife and habitat protection. In summary, we wish to avoid the onset of the bird nesting season. With the delays caused by the onsite protest this has become a very tight timescale and postponing the works further will mean additional unidentified costs and potentially compromising the overall programme for the project. As outlined above, we see no justifiable reasons to halt the work and as such the programme will continue but we will continue to listen to comments and concerns from members on the public and respond accordingly. The plans for Alexandra Park are extremely exciting and the Council are confident that through consultation they have developed a plan with the local community that will ultimately allow more people to use and enjoy the park. -who have been left with little other effective choice to stop your vast tree cutting and wildlife habitat removal plans – due to your some have said “arrogant” attitude to a very significant objection to your plans. Even if the Council put TPOs on the few remaining trees around the courts, the Council using their role as planning authority can just give themselves planning permission to add the extra courts later. Planning permission always over-rides TPOs, effectively revoking them. Also TPOs are rarely used upon trees on land controlled by a local authority, they are used to protect trees on private land from deliberate damage and destruction by private individuals or businesses. The Council, in its role as planning authority have the discretionary power to create and revoke TPOs as it sees fit, without having to explain itself to anyone. So any effort to protect the trees in the park using TPOs isn’t going to be effective. We need to be asking the Councillors why planning permission was granted without a full and proper BS:5837 tree survey having been carried out, especially given the large number of trees impacted on by this development. Why has the Council ignored the recognised British Standards and procedures laid out in BS 5837:2012 and what sort of example is the Council setting to private land-owners who have ‘inconvenient’ trees on their land. Without producing accurate scale drawings showing the exact location of every tree and the root protection areas of trees to be retained, how can they be sure what is feasible and what is not? It is entirely feasible to have public accesses through the root protection area of existing trees. Tree protection fencing or barriers are designed to exclude heavy vehicles and machinery, not exclude people. A tree may take a century to reach maturity, so protecting and caring for them properly during the construction phase of a project is very important. By not making any effort to implement BS 5837:2012 the Council are acting contrary to best arboricultural practice. BS 5837 is about getting the proper balance between the needs of tree protection, construction and public access. To argue that you can’t implement BS 5837 because of the need to retain public access to every tree is to make a fallacious argument. Following the IRA bombing, Manchester City Centre was a construction site for many years. Despite the large numbers of people using the city centre daily and the massive amount of construction work taking place, it was possible to erect fencing to protect the public from risk, whilst allowing public access to most areas. If it is feasible to use protective fencing in a city centre and balance the needs of construction, public access and public protection, then there is no reason the same cannot be done in a public park. Why would we have British Standards if it wasn’t feasible to implement them? If you cannot erect tree protection fencing because of undergrowth, you cut back the offending vegetation using a brushcutter. In the real world, people use brushcutters to cut back vegetation to erect fencing every day. The presence of a bit of bramble in some areas is not a valid reason not to implement British Standards across a 60 acre site. If the Council have no intention of implementing root protection areas and protective fencing, how can claim to be implementing a Tree Protection Plan? If a Tree Protection Plan doesn’t conform to BS 5837:2012 then it isn’t a real Tree Protection Plan, just like their tree survey and tree felling plan which don’t conform to recognised industry standards. Also tree protection fencing or barriers are versatile and be erected on a variety of terrain, including on “hardstanding” areas like pavements, driveways and tarmacked areas. None of the reasons the Councillor gives for not implementing BS 5837 stand up to serious scrutiny. The above ‘wetland area’ only became so wet when in early December, United Utilities were digging and pumping drains/sewers directly oppposite on Alexandra road. The water appeared then along with a really bad stench. Thats the wettest its ever been and has been sinking back into the soil ever since leaving a stinky. oily residue.